well,the topic head says it all!! please add ur recipes (which preferably doesn't need any kitchen stuff except for probably an electric kettle)! !lets just make this thread for everyone 'helpless'!lol!!! #peanuts or any other nut/seeds etc. (this is optional if u are intolerant); u can use roasted pumpkin seeds as well. just add everything and toss! Interests: Age is an issue of mind over matter.If you don't mind it doesn't matters. overnight oats(as i've seen on some blog) and fruit chaat are good ideas. 1. dry roast cumin seeds in a pan with/without red chillies. 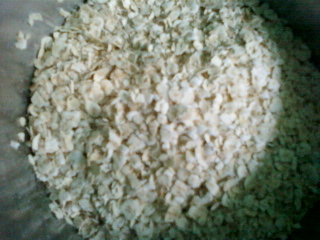 (dont overdo,just toss in medium/low flame for a minute or two).cool them and grind them in powder. can be stored in room temperature for months.this has multi-purpose use in puffed rice,sattu,poha(flattened rice) and more! We have a cooking for newbies thread. sattu is half boiled (cooled) --> dry roasted(on sand) --> then ground chickpeas. 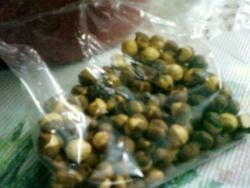 (although some site - read wikipedia says there's other pulses too,but its primarily(or only) chickpeas). this doesn't need cooking and has many recipes. u can make drinks too. U need: sattu(its quite heavy on stomach so start with less initially,increase a lil' next day if u feel u can have more),black salt(low sodium),the 1st spice mix(roasted-ground cumin-chilli),lemon juice. 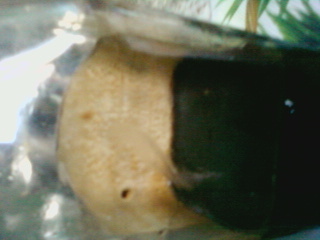 u can add a lil' jaggery if u like it sweet but thats not a must. add water as per ur need. u don't need a blender or anything. stir it up in a glass or jug and u stor it for two days without a fridge. Well the place from where i hail, children who have a problem sweet tooth and who crave for sweets all the time are given a healthier sweet dish.They mix sattu + cold water +lots of sugar.It's a delicious thick paste which kids gulp like pre- digested food . I loved it when i was small. Now, people also eat roasted sattu. And it tastes pretty good. ur health won't like it. use a lil' jaggery.jaggery is good in terms of nutrients too. get rolled oats that just takes 3 minutes to cook. but u needn't need fire. but u definitely need hot water. U Need hot water/boiling water or less hot than that will also do. pour in hot water till all of it is just submerged. 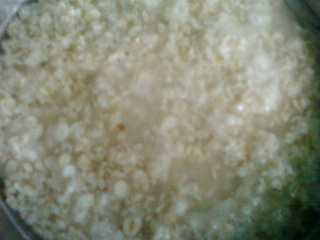 DON'T usetoo much of water because that is going to make the oatmeal all gooey and too soft to eat. 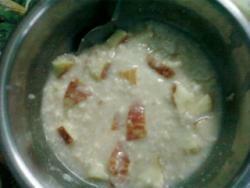 cover the bowl.it hardly takes 3-4 minutes; but there is no worries if u keep it longer. jaggery in this case is not a great option IMO. i just add apples chopped into smaller pieces. dry fruits/nuts of ur choice - walnut,almond(chopped),cashew(chopped),etc. the black chickpeas are smaller but more nutritious than the bigger white chickpeas(garbanzo beans). NOTE : the traditional method is different and not done in an oven but on sand.that is infact the method used when getting the store packet ones - which btw are crunchier and tastier.